NO SON OF MINE IS EVER GOING TO GET HIS EARS PIERCED. That’s what I said. As far as the weekend went, tip of the iceberg, my friends. Just the very tippity tip. I wish I could keep from writing about creepy crawly things that slither in the night. Really. I do. You may have noticed that I’m sort of focussed on the 8 year old boy to provide the blogging material. A sad state of blogging affairs occurs when you’ve been blogging since your 2 oldest children were small enough to lock in the tupperware cabinet, and have now sprouted into two beautiful young women who are taller than you are and can no longer fit into the tupperware cabinet. And since they are now a teenager and a tween, I cannot talk about them without paying them actual money. Because now BOYS are flitting around, and there’s all the TEENAGE ANGST, and PUBERTY, and I have had to take an oath of silence about their everyday trauma. It’s killing me. The fodder. It is plentiful. And yet I’m silenced. Alas. I will focus on the boy child, who possesses no filter, and does not care one iota what people think of him. Jensen has a very vivid imagination, and has been known to report alleged sightings of Komodo Dragons, alligators, and stray Pythons in his path. We’ve discussed the importance of always telling the truth, blah, blah, blah. But when you’re 8 and rather obsessive/compulsive, your imagination is firing on all cylinders ALL THE TIME. The front teeth were an all-weekend ordeal, as he noticed suddenly that both front teeth were very very loose. One came out easily, but the other was a bit more stubborn, moving to the center of his smile and hunkering down for the long haul. A long piece of dental floss was tied to the tooth and Cailey happily suggested that the other end be tied to the bumper of the car as it sped away. Jensen had a better idea. His plan was a swift kick, but he lost his nerve. The tooth remained. So we struck a deal. I was allowed 25 wiggles of the tooth, and then I had to check on the Cobra Snake, whether or not the tooth came out. I got in my 25 wiggles without loosing a finger, but the tooth remained. Because I am an awesome mother who loves nothing more than to feed my son’s neurosis, I trudged out into the back yard in my pajamas. Thankfully, Emme was a good sport and accompanied us. Jensen said that the Cobra was underneath the rain gutter. Emme picked up one of Jensen’s long lizard hunting sticks and lifted the gutter. Underneath was a LARGE COLORFUL COILED UP SNAKE. WITH FANGS. I screamed and made a made dash for the safety of the house. Leaving my two children out in the yard. (I will be awaiting my nomination for Mother of the Year.) Fiddledaddy came to see why I was hysterical. This time. 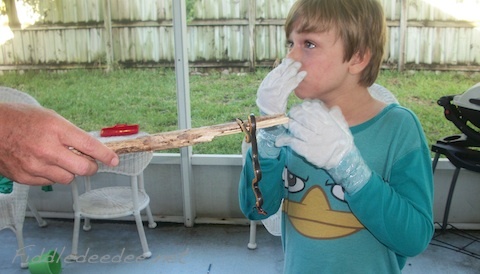 As he began to investigate the snake, Jensen suddenly feared for his father’s life. And he began screaming hysterically. Thankfully our neighbors are used to us. The snake became acquainted with the business end of the shovel and was relocated to the nature preserve. And I put the house up for sale. And let’s just send up a collective prayer that this will be my last snake-centric post. If you were to ask my daughters what they wanted to be when they grew up, you’d get a variety of answers, depending on when you asked. For example, a few years ago, the standard answer was “princess”. The other day the over achiever announced that she wanted to be a worker at McDonald’s. In her defense, I think she’s looking at the practical aspect of acquiring a McDonald’s Mocha Frappe with whipped cream at a discount. Especially since her mother doesn’t share well. I do believe there’s time to raise the bar a bit on her goals in life. If you were to look further down the DNA ladder to the boy child, his career choices have been well documented on this blog. He began his life aspiring to become a Plumber. Something that I’m still holding out hope for because I believe that every family can use a good plumber. Duct tape can only take you so far. Then he announced that he wanted to be a dog. We really thought that one would stick. But alas, the neighbors are relieved that he no longer barks and growls at them as they hurriedly fetch their garbage cans to and from the curb. His career goals are now split evenly between that of Paleontologist and/or Zoologist. And seriously, I think he has a real future. He devours all books that are dedicated to the study of dinosaurs and reptilian creatures in general. He is also a dedicated fan of Jeff Corwin, an animal and nature conservationist who is best known as the host and executive producer of Animal Planet’s The Jeff Corwin Experience. This is a delightful show that we have captured from Netflix, and it provides young Jensen untold hours of scientific insight and information. And you can bet that Jensen has paid a good deal of attention to how his mentor handles wildlife. As was witnessed yesterday on our back porch. Fiddledaddy had gone out to enjoy his morning coffee, when I heard him utter a string of words that made me believe he was not alone. Indeed, he nearly stepped on a small snake. He then learned the hard way that snakes can be stinky. 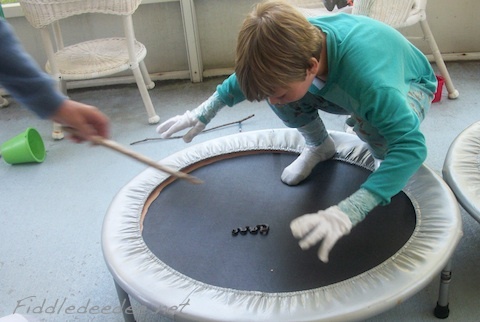 And yes, those gloves have been burned. If you were wondering where I was during this exciting adventure, it was the far end of the house, putting as many doors as possible between me and the offending snake. I may or may not have been curled up into the fetal position. I would like to report that the snake was safely released into our nature preserve (fancy name for scary overgrowth that we had to pay extra for when building our house). 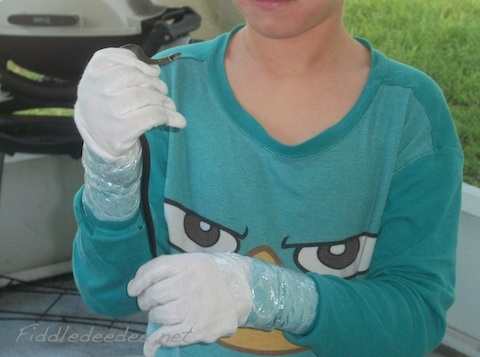 After a bit of research, the snake wrangler and his father learned that this was a Florida Ringneck Snake, indigenous to Florida (hence the name) and completely harmless (unless of course had I been the one who ventured out onto the back porch that morning and died suddenly of natural causes). My son, the Plumber, is sounding better and better. Even my son, the Dog, has a certain ring to it. I mentioned that I located a pet store that does indeed sell guppies of the female persuasion. 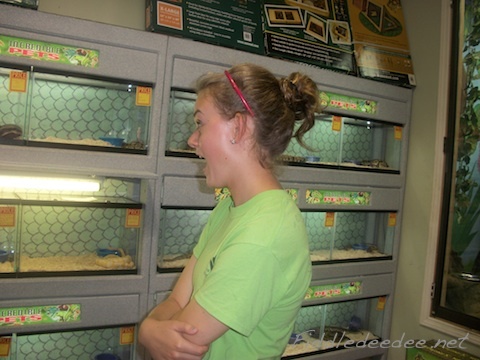 It also happens to be a SPECIALTY pet store that also carries lizards and reptiles of all kinds. In other words, it was Disney Land for Jensen. We first perused the fish, then sauntered by the Lizard population (slowly, oh so slowly), and then rounded the corner to encounter the snakes. This is my son standing next to THE GIANT PYTHON. I’m pretty sure that I’ve read they can break glass. We kept going and found the wall-o-snake cages. And because I am gifted when it comes to timing, we arrived at the lunch hour. The snake wrangler informed us that we were in luck, as he was preparing for the feeding. I thought to myself, oh cool, snake chow, a little salad? And then he plopped A PRETTY LITTLE LIVE WHITE MOUSE into the snake cage. My children crowded around the cage. I sprinted for the other side of the store. Just before everything went dark and the last thing I saw was the bird cages, suspended from the ceiling. And I am not kidding. It should be noted that I’d had 6 vials of blood drained from me earlier in the day, SO I WAS MOMENTS AWAY FROM AN AMBULANCE RIDE. It’s Willard, all over again. 1971. And I still have nightmares. Not that I would ever stoop so low as to blame my parents for all of my many neurosis, but really, who takes an 11 year old to see Willard? Or the sequel, Ben? Or Bonnie & Clyde? Or The Exorcist? This was the only image I could bear to take. That of my oldest daughter enjoying the carnage. Cailey kept trying to give me a blow by blow description of the snake’s snacking opportunity. I kept putting my fingers in my ears to drown out the horror. Finally I had to play the YOUR-GROUNDED-FOR-THE-REST-OF-YOUR-LIFE card lest she continue. We made it back to the aquatic arena and had the nice employee fish out a male and two female guppies. Then we blissfully headed home with 3 live fish. And arrived with only two. Which if you’re doing the math means that we have to go back to that chamber of horrors to trade out the dead fish for a nice new live one. Jensen is happily ensconced in his dinosaur phase. Still. I believe this may be the longest lasting phase that we’ve experienced in his 7 years. Longer than the toilet fascination phase even. We learned that there is a bona fide dinosaur store in our area and Fiddledaddy took his budding paleontologist for some father/son bonding. He stood back with pride as his young boy took on nearly every employee within earshot discussing various dinosaur aspects and speculations. And believe me, he knows them all. He is well familiar with all of the herbivores, carnivores, and even the omnivores (for good measure). He can also discuss time periods and give you a run for your money when supporting the creationist point of view verses the evolutionary standpoint. And while the dinosaur is now extinct, I fear that the lizard population may be next. 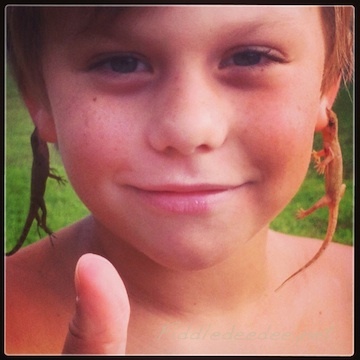 Jensen has deemed the local lizard to be the closest thing to a dinosaur that he can capture and call a pet. And yes, he has tried to sneak a few into the house. 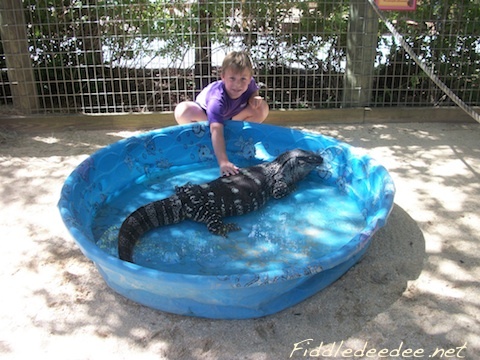 But I’ve made it a practice to conduct a full cavity search before the boy comes in from the backyard, so that no lizards end up sharing my personal space. The only problem with keeping lizards as pets on your back porch, is that, well, they inevitably die after being loved to death. I don’t know what is more heartbreaking, Jensen’s mournful crying after he realizes that “Scales” the pet lizard is not really sleeping, or the thought of all the horror “Scales” must have endured during his brief captivity. 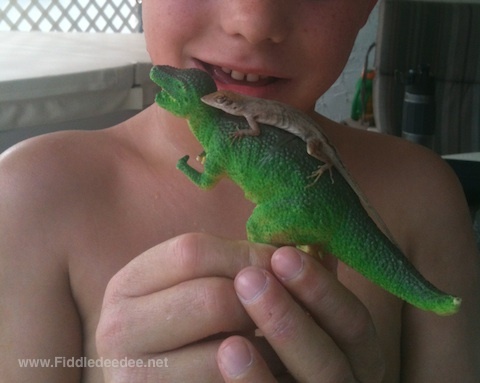 And please, don’t recommend getting the child one of the lizard-like creatures from the pet store, because you just have to know that it would not end well. We’ll just continue on this path and I’ll send a sister onto the porch first thing every morning to release any captives from the night before. And then I’ll hope above all hopes that his wandering amphibious seeking eye does not turn to the frog population, that I’m so fond of. For a number of years, I have waxed poetic about my deep and abiding fear and loathing of frogs, toads, and slimy things that generally hop. I have, in fact, devoted an entire category of posts, aptly titled Amphibious Fables, to this very worthy cause. Much to my surprise, our new canine addition to the family has taken it upon himself to rid our yard of all pesky frog-types. Earlier today, my daughter caught sight of him prancing about the yard with two frog legs dangling from his mouth. Since Mater created his own unintentional doggie door leading to the back porch by punching through the bottom plate of the screen, I enlisted the help of the daughter who knows no fear when it comes to dealing with frogs, before the dog decided to bring his present indoors. She extricated the hapless frog from her dog’s mouth and hurled it into the nature preserve. Then later this evening, as the sun set, Mater set out for one last romp in the backyard. The squeamish sister once again alerted us that Mater had found another frog. Only this time he ate it. She came running inside in a panic because the dog was having trouble breathing. Fiddledaddy and Emme tended to the dog, while I ministered to the more high strung of my brood, who were certain that dog death was eminent. For a good 10 minutes, the dog heaved and groaned, having changed his mind about his dining experience. But nothing would come out. Fiddledaddy stood ready with the Heimlich maneuver, and Emme was preparing herself for mouth to mouth. I was mentally adding up how much therapy was going to cost should our new dog kack in front of the children. At long last he muscled down the toad, and began running about the yard, barking at mosquitos. After this ordeal, Fiddledaddy sent me an article about how certain frogs are terribly poisonous to dogs. Until reading this particular article I would never have thought of the dangers of a dog to frog contact, but dogs have actually been known to die because of the toxins that frogs give off. Basically, the remedy that is called for is to rinse the dogs mouth out with the hose, making sure not to force water down their throat. And if the dog is seizing, get them to an emergency vet center as soon as possible. All I have to say is that my fear and loathing of frogs has most certainly been vindicated. The end. Oh, and don’t forget to enter my giveaway for the ZAGGsparq 2.0 (a portable USB power source valued at $99.99). I’m giving away three of them, and the contest ends Saturday night! 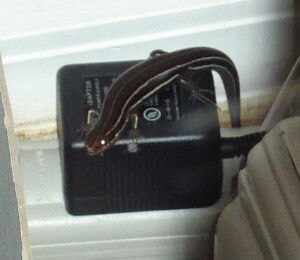 A while back, I announced that a largish black salamander had taken residence in our garage. And made mention that the garage was now dead to me. No mans land. A place I no longer graced. Well. I admit to a few trips out there, while wearing closed toed shoes and with the lights on full blast, because that is where my beloved upright freezer is housed. But other than that, I just open the garage door, and toss stuff that needs to go out there, well, out there. Fast forward to Saturday, when I was ordered to bed rest by Fiddledaddy. My knee is inflamed again, which I can barely speak of without breaking down into heaving sobs, and I’ve had all sorts of tests done, but am now awaiting results. I’m not very good at that waiting business, by the way. Fiddledaddy left to do some emergency grocery shopping (read: we were out of ice cream sandwiches) and took most of the offspring with him, leaving Emme home to keep an eye on me. Because when ordered to bed rest, that’s usually the last place you’ll find me. But I was dutifully complying because WHAT HO, my iPhone morphs into an iPod. MUSIC, SWEET LIGHT 70’S ROCK MUSIC! Emme was laying beside me playing a game on the laptop. I stuttered and stammered until I finally relayed that I thought a large black Salamander had just moved in under the bed. AND IT WAS HUGE! Emme stood on the bed with me, not that she was frightened, but because she’s generally not allowed to stand up on the bed. Eventually she got down and because she is my daughter, she went for the camera. This image was captured while I was phoning Fiddledaddy alerting him to the event. He asked me if I planned on standing there until he got back, and I said yes, that was the plan. Yes, except on ‘Bindi the Jungle Girl’ it’s rare that the adults ever wet the bed. She crept around on the floor, peering under the bed with the industrial flashlight. Meanwhile, my bladder got the best of me and I lightning fast hobbled off the bed and made haste to the sanctity of the kitchen. Where eventually I sat up camp watching from the doorway into my bedroom, seated on my comfy office chair, eating Pop-Tarts. Because that’s what I do in times of extreme stress. Eventually Emme flushed the offending Lizard/Salamander/Monster out into the sort of open and I was able to take a picture, using my handy zoom feature. So as to remain 1/2 mile away. Notice the beady eyes, as he craftily tries to blend in with the electrical ware. I will admit that the creature was not nearly as large as I had first envisioned. But still. IT WAS UNDER MY BED. Eventually, Fiddledaddy and entourage arrived back home, and all the family ascended on the bedroom. Sans me, who remained stationed in the kitchen. I heard a good deal of furniture being overturned, squeals of both fear and glee, and crashing precious family heirlooms. Eventually Fiddledaddy came rushing out of the bedroom, with something wrapped up in plastic, heading to the nearest exit. I breathed a sigh of relief, until I turned around and Emme stood directly behind me holding an amputated Salamander tail. Which was still wriggling. Then the room went dark and my eyeballs rolled to the back of my head. It’s a good thing that the Salamander and all his body parts were successfully evicted, because I am in no mood to move to a different house during the heat of the Summer.